I recently returned from a fascinating trip to Israel. My trip covered a large portion of the country, which is a little larger than New Jersey. Being able to drive to different areas gave me the opportunity to take in all the amazing features in both rural and urban settings. Although traveling for pleasure, this trip turned into a captivating educational experience. In addition to the history lesson, I learned about Israel’s approach to remaining sustainably sound, even in a desert climate. There are many technologies and processes used in other countries that originated in Israel. This blog post will discuss several of the sustainability challenges Israel faces and how the country has conquered these challenges, including some of the technologies that came out of these adversities. Israel’s desert climate is hot and dry with very little rainfall. The Sea of Galilee and underground aquifers are the only natural source of potable water for the country. Israel took initiative in the 1960s and designed/built its first desalination plant in Eilat in the south of Israel using water from the Mediterranean Sea. According to an article by The Next Web, “Today, about 60 percent of Israel’s domestic water demand is met through desalination.” Reverse osmosis is the primary technique used for desalination, a process founded by an Israeli scientist in the 1960s. 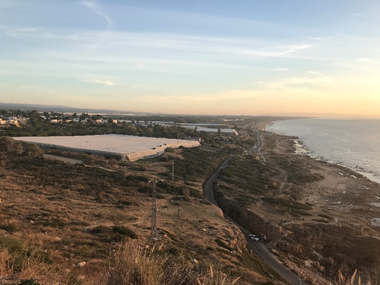 Although desalination has its environmental concerns (both a high cost process and uses high energy consumption), the method developed in Israel is used in other water scarce parts of the world, including California and China. The people of Israel are still conservative with their water usage. To offset energy costs, more than 90% of the homes in Israel use solar hot water heaters. Spotting these installed on the rooftops of most buildings became a normal sight to see (Figure 1)! Figure 1. 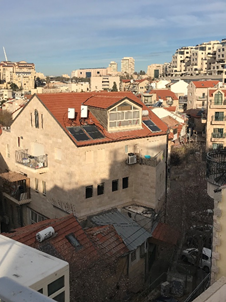 Solar hot water heaters on residential buildings in Jerusalem. With water supply not being an issue, agriculture flourishes in this desert climate. Agriculture is an important part of Israel’s economy and provides a fresh source of food to the country and for export. Throughout my travels, agriculture was everywhere! Some farms were completely covered in tents or netting while others are exposed to the desert sun, depending on the crop (Figure 2). Figure 2. View of banana farms in Rosh Hanikra (North District). One frequently used technology around the world, which was developed in Israel, is drip irrigation – “a type of micro-irrigation that has the potential to save water and nutrients by allowing water to drip slowly to the roots of plants, either from above the soil surface or buried below the surface.” Another example of an advanced agriculture technique is the use of “thermal imaging for precise irrigation guidance” (Figure 3). 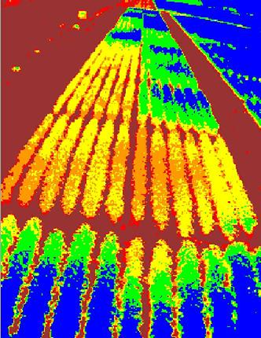 Thermal imaging provides maps to the farmers which are used to determine if their plants are over irrigated, under irrigated or just right. Adjustments can be made to the irrigation methods for different plant zones using this information. Israel’s cities and towns are growing, especially Tel Aviv, the urban hub of the country. This has resulted in an increase in construction, both new buildings and retrofits. The Israel Ministry of Environmental Protection is promoting their developed green building standard, which includes sections on energy, land, water, waste, health and wellbeing, environmental management, transportation, materials and innovation. A couple of examples of green building projects include an energy renovation project as part of a “neighborhood renewal project” in a southern Israeli city as well as net zero energy buildings for Israel’s Air Force, in addition to many more! Israel has made strides in many sustainability sectors. I look forward to seeing how they continue to advance technology in all areas and my next opportunity to visit such an incredible country.